Art and Science both maintain a close relationship with observation. The scientific process is used to translate hypotheses into theories while the artistic process involves communicating visual information in order to imbue meaning to a subject. My work is an investigation of the relationship between the micro and the macro using the same tools of observation utilized in the sciences, but within an artistic context. 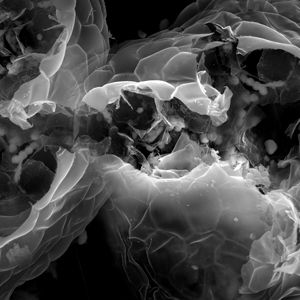 Microscopic and telescopic imagery reveal patterns of structure and growth that mimic one another. On a macro scale, galaxy clusters seem to mimic the configuration of neurons whereas microscopic cells seem to function as societies, with each structure of the cellular body fulfilling its occupation within its shared environment. Technology takes a major role in the human quest to understand and navigate the relationships between what we study and observe and how we define ourselves. These microscopic/macroscopic depictions are a metaphor for the duality of the idea of self as an immense and intricate system of millions of complex processes as well as minuscule cell within an infinite expanse of presence and instance.